Ah, the humble burger – a product loved by Popeye’s sidekick J. Wellington Wimpy that came about to meet the culinary needs of a society rapidly changing due to industrialization, the emergence of the working and middle classes as well as the demand for mass-produced, affordable food that could be consumed on the go outside of the confines of your home. The stripped down version with beef and bread is fabled to have been invented in North America, before it became a globalized culinary icon and was prepared with the typically characteristic trimming, i.e. lettuce onions and sliced pickles, that we know today. The burger pervades modern culture and its global expansion provides economic points of comparison like the big Mac Index, by which one can compare the purchasing power of different countries wherever the Golden Arches are situated and wherever Ronald McDonalds finds a bench to sit on. Many a variant of the hamburger has been created over the years, including the modern one of so-called gourmet burgers with luxury ingredients prepared by proper chefs. Its nutritional values have been widely and controversially discussed and healthier, i.e. reduced calories and vegetarian / vegan options, have been introduced. Since everyone is familiar with the staples of global burger chains, I would like to induct you to some that are specific and recommendable in Oceania – and yes, for the record, Burger King is called Hungry Jacks in Australia due to the fact that Burger King was already trademarked by a takeaway food shop in Adelaide. Aight, moving on. 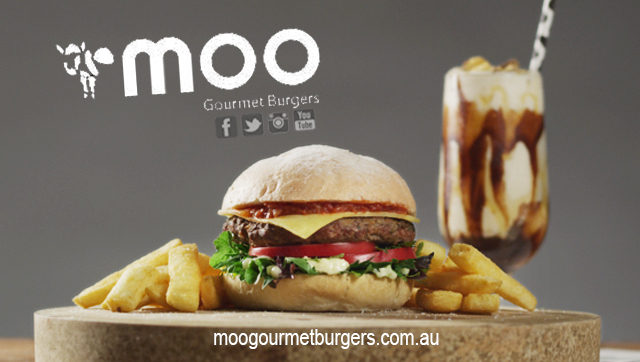 Moo Gourmet Burger is what you want to try. Based on the concept and the family heritage of a milk bar empire, hence the “MOO”, Moo Gourmet Burgers reintroduced the old fashioned milkshake and named their signature burgers, “The Black & White®” and “The Deluxe®“, after their establishments. Moo Gourmet Burgers only uses ethically farmed, free range, free to roam, sustainable produce free from hormone growth promotants and antibiotic treatments. Their beef burgers are made with 100% Australian Grasslands Premium Beef and they only use free-range eggs in addition to ethically farmed and sustainable meat products. They offer multigrain & gluten free buns and have 3 vegetarian options on their menu as well as a selection of premium burgers including their double decker Wagyu beef “Deluxe Moo®“, Duck & Bacon, Greek Lamb, and, my absolute favourite, until recently – the Grilled Salmon. It has now disappeared from the menu and I am still in mourning. Seriously, MOO – bring it back. Moo Burger also serves alcohol, which is a rarity when it comes to burger establishments and overall has more of a restauranty vibe. The idea behind Lord of the Fries began over late night snack excursions early in 2004. Mandy (Toronto) and Mark (Melbourne) met while living in Taiwan. Their love for fries drew them closer, and their disdain for nasty frozen chemical fries inspired them to create their own distinctive fry. They wanted fresh potatoes, thick but not too thick, crispy but not too crunchy, saucy, the mission began. home-made sauces all inspired by flavours found across the globe, eventually expanded to a menu including Veggie Burger, Onion Rings, Vegetarian Nuggets, and Vegetarian Hot Dogs. Everything at Lord of the Fries Vegetarian, Kosher and Halal; and they also have Vegan and Gluten Free options. Their fries are made from locally (and seasonally) sourced, fresh Aussie potatoes, cooked with their skins on in sustainable non-GMO cottonseed sunflower oil blend and ready to be enjoyed with any of their internationally inspired dipping sauces. 100% vegan without chemicals, toxic preservatives or other nasties. From the original veggie burger that will have cheeseburger-lovers dancing in the streets to their less-than-classical but scrumptious range of quirky veggie burgers, they have a burger to suit every taste bud, e.g. with vegetarian burgers such as the Poutine and Parma. As far as sauces are concerned, whether you’re in the mood for an American buzz or a Mexican fiesta or the explosion of Indian spices, Lord of the Fries has a range of internationally inspired and tasty sauces. Made specifically for the chip-dip, their range of 100% vegetarian sauces are not a bad accompaniment at all. Apart from burgers, they also offer vegetarian / vegan hot dogs and sides including vegetarian onion rings and vegan milkshakes. Kleiner Abzug in der B Note: The Lord of the Fries outlets are aesthetically the least appealing of the bunch and do not exactly invite one to consume their emissions on site. Taking that into consideration the overall yum factor still comes to a solid 8 /10. Having originated in New Zealand in 1995, Burger Fuel planted the Kiwi flag in Sydney in 2006, where they made a dent in the burger scene with their 100% Kiwi beef, batched brewed sauces and wide range of vegetarian and vegan burgers. Burger Fuel prides itself on using pure, natural ingredients, ripped straight from Mother Nature’s sweet bosom before anyone's had the chance to defile them with additives. They perceive the burger to qualify as a balanced meal - a combination of protein, carbohydrate, good fats, fiber, fresh fruit and vegetables. Burger Fuel’s wide-ranging menu features pure grass fed Australian beef, butterfly cut, grilled chicken, vegetarian and vegan options certified by the New Zealand and Australian Vegetarian Society and vegetables hand washed and cut daily. They also offer inclusive lifestyle options like gluten-free, low-carb, halal and dairy-free. To alleviate your conscience a bit of your burger eating guilt, they run an ongoing ‘enviro-mental’ and sustainability campaign - a lot of tree hugging has gone in to the design of their chip cups, doofers and burger bags. The Burger Fuel position on social and environmental concerns started at its inception in 1995. 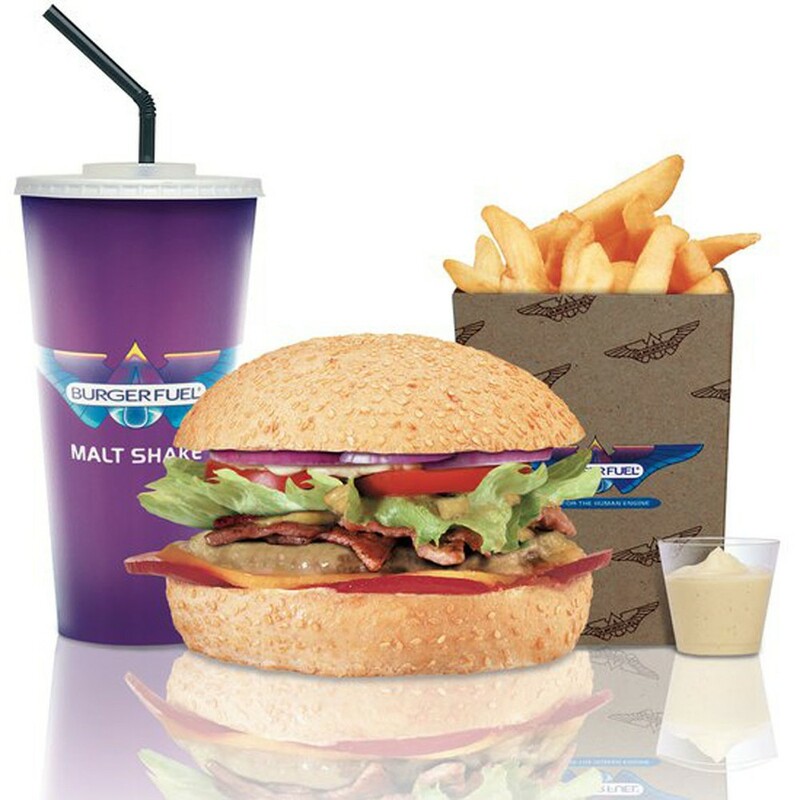 As part of their continuing “enviro-mental” and sustainability ethos, packaging has been designed and manufactured to strict Burger Fuel specifications and requirements, which resulted in recycled, recyclable and biodegradable packaging. They even made sure the ink is made from a natural vegetable oil base sourced from renewable resources, instead of the usual mineral oil solvent stuff and their aioli punnets are made from biodegradable cornstarch. Personal favourites at Burger Fuel include the GOURMET VEGE with organic tofu, teriyaki sauce, peanut satay sauce, smashed avocado, salad, relish and aioli and the V-DUB VEGE with crumbed pumpkin, carrot, chickpea and ginger bites (Motobites), melted cheddar, raw grated beetroot with chia seeds, salad, relish and aioli, as well as V-TWIN VEGE with mushroom, kumara, chickpea and basil patty, melted cheddar, plum sauce, salad, relish and aioli.